In our constant endeavor to empower sales teams, improve sales performance, and boost company sales, we’re excited to inform our ScanBizCards enterprise users about the New Salesforce Managed Package we have released on October 3rd, 2018. This new managed package will make things easier for enterprise users by offering them a quantum leap in functionality, usability, and speed. 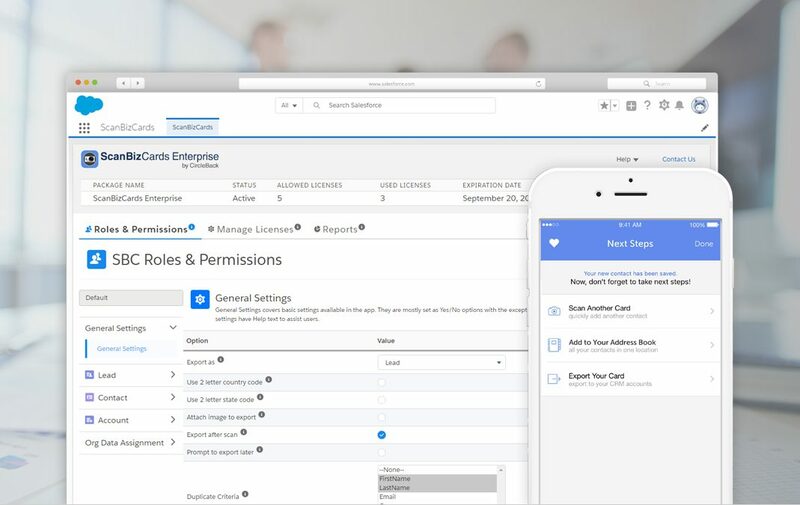 Lightning experience is certainly the future of Salesforce user experience, so we decided to make ScanBizCards enterprise app lightning ready. Gear up to take advantage of the modern, productivity-boosting user experience designed to help sales and service reps focus on the right deals, the right customers and the right activities. Our new interface is definitely a step forward to bolster your business growth attempts. Unlike our old UI, our new UI lets you access all the major app functionality from a single window fully addressing the app usability and presentation aspects. The admin users can now manage user licenses and assign roles and permissions more easily and efficiently. Moreover, our enterprise users will soon be able to export their scanned cards to Salesforce as attachments or files and will be able to even delete these cards after exporting them to Salesforce, keeping their device clean and organized. And that’s not all! The managed package is now also equipped with a dedicated reporting functionality for the Admin users. These reports can help admins analyze the app usage and keep a tab on the user activity. So, let’s get started! Explore the new managed package with the help of this guide – Installing ScanBizCards through AppExchange. With our new managed package, you’re on your way to boost the flow of great contact data into your funnel quickly and efficiently. However, to take advantage of the enhanced features, make sure to simultaneously update both your mobile app and the managed package. To know more about our new managed package, feel free to contact our support team at enterprise@circleback.zendesk.com at any time. In case you have any suggestions for us to further improve our offerings, we would love to hear back from you.